Since I stopped working last summer, my body clock has shifted. When I was working, I was up at 5:30 AM and in bed at 10 PM (unless there was an episode of Law & Order that I had not seen that was on at 10). 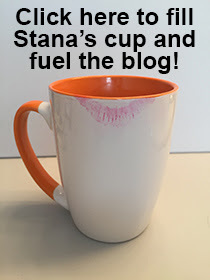 After leaving the workforce, I began staying up later and later each night reading and writing, while the television blasted in the background (just in case an episode of Law & Order that I had not seen shows up). So these days, I am in bed between midnight and 1 AM and up and at 'em at 7 or 8 AM depending on when I went to bed. This schedule serves me well when there is a late Red Sox game on the television, for example, like last night, when the Sox ended the Yankees' season at 11:35 PM. Or when there is an episode of Law & Order that I have not seen. 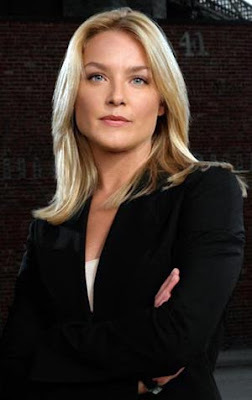 Getting this post back on track, I decided that Serena Southerlyn (played by Elisabeth Röhm) is the Law & Order Assistant District Attorney I would most like to femulate. So now you know! Jim Beudin femulates on the "Sweeps" episode of television's Law & Order. As to Serena Southerlyn, I remember all the comments when she left the DA Office because she thought she was being fired because she was a lesbian, and it was the first time that was ever mentioned about her sexual orientation...today she could be open and be herself and it would add to the story line. It is amazing just how much our sleeping patterns change when we retire.